Did you know that within 20 minutes of smoking that last cigarette, your body began a series of positive changes that will continue for a decade or more? You have significantly reduced your risk of death from stroke, heart disease, emphysema, chronic bronchitis, and several kinds of cancer­; not just lung cancer. Cigarette smoking is responsible every year for approximately 130,000 deaths from cancer, 170,000 deaths from heart disease, and 50,000 deaths from lung disease. Our goal is to support you nutritionally as your body begins to heal, and to support your blood sugar to modify any food cravings you may develop. According to Dr. Joseph Mercola, researchers are actually documenting neurochemical effects which support the concept that cigarettes may actually be a drug that smokers are using to treat their underlying chronic anxiety and depression. In conjunction with diet and exercise changes, he recommends a stress-relieving technique called EFT (Emotional Freedom Technique). When you quit smoking, within 12 hours the potentially toxic carbon monoxide levels in your blood drop to normal. Ten years after quitting smoking, your risk of dying from lung cancer is half that of a smoker’s. Although quitting smoking definitely creates healthier lungs, there are several steps you can take to maximize your lungs’ health. Talk with your doctor about your current lung and overall fitness levels and for any recommendations or restrictions that may be specific to your condition. Stock your refrigerator and cabinets with plenty of healthy foods, particularly those filled with antioxidants such as fruits and vegetables, and be sure to include carrots and other beta-carotene-rich foods. Research published in 1991 in “Nutrition and Cancer” suggests that eating as little as one carrot per day could cut the rate of lung cancer in half. Plan an exercise program that includes endurance exercise such as walking and bicycling, which are some of the best things you can do to keep your lungs healthy. Take yoga or Pilates classes, especially those that concentrate on deep breathing techniques. Below is a timeline that shows how your body is regenerating over time. Over time, the lungs of a regular smoker get coated with tar. This can lead to serious health problems like bronchitis, emphysema and, ultimately, lung failure.A lung detoxification is an essential part of your healing. It’s definitely worth the effort, and the effects just may help you extend your life! Now that you have a good idea as to why lung cleansing is important for your health, let us take a look at the detoxification process. A lung detox program has three important aspects: breathing exercises, diet and cardiovascular activities. Taking deep breaths is the first step toward making your lungs healthy. Meditation, Pilates and yoga can help you deepen your breathing and make your lungs stronger. Regular intake of food items like cow dairy products, feedlot beef, margarine products and transfats, white flour, refined sugar and coffee produce a lot of mucus in your body. This leads to a build-up over time, which significantly affects the capacity of your lungs. 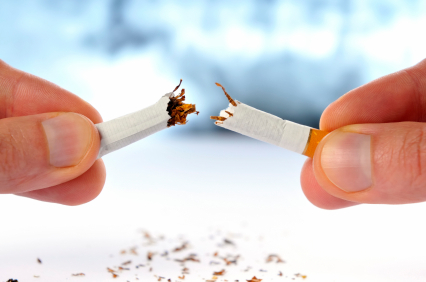 Smokers gain an average of 10 to 12 pounds after quitting smoking, partly due to cravings resulting from quitting, and partly due to their metabolism slowing down after they have dropped the habit. Depression is also a common side effect when quitting smoking, making it very difficult for a smoker to make any major changes to his/her diet. In fact, Dr. Mercola recommends you begin changing your diet before you quit smoking, so that bad habits like sugar and carbohydrate cravings after quitting are lessened or eliminated. Small frequent meals are advised to keep blood sugar steady. You may find yourself craving grains and sugars while coming off of nicotine, and you may find your metabolism is sluggish. Eat an anti-inflammatory diet to reduce cravings: pastured meats, bone broths, raw dairy, good fats in the form of ghee, coconut oil and coconut butter, wild-caught fish, avocado and flaxseed, and lots of organic vegetables and apples, pears, oranges and berries. Some studies indicate that a diet that is low in fruits and vegetables may make a person more vulnerable to the cancer-causing agents in tobacco smoke. Conversely, growing evidence is suggesting that a diet rich in fruits and vegetables lowers cancer risk. Daily juicing (example: five celery stalks, one carrot, ½ lemon, one piece of ginger, one bunch of parsley, one apple) is a quick and easy way to receive the healing, oxygen and antioxidant-rich benefits of organic vegetables and fruits- also provides a great energy boost. Regenerative, oxygen-rich foods will help rebuild cells and cilia damaged by tobacco smoke. Grapes, almonds, olives, water chestnuts and apricots are all considered ‘lung friendly’ foods. Most importantly, drink at least six to eight glasses of water every day. Increase your intake of chlorophyll-rich food substances like spinach, spirulina, and chlorella, which play an important role in cleansing your lungs. If you want to strengthen your lungs, you should exercise for at least 30 minutes a day, five days a week. Walking, running, cycling, and any other exercise that increases your heart rate to 120-130 beats per minute is good for your respiratory system. *These herbs, however, should be used in a lung detox program only after consulting a qualified herbologist. One of the only multivitamin formulas that does not contain beta-carotene, 500mg vitamin C, K2 instead of just K1, methylated b-vitamins and bioavailable forms of the minerals. As we know smoking increases the risk for heart disease. But why does it? Oxidative stress from toxicity. Exposure to toxins contain free radicals, which promotes the growth of atherosclerotic plaques. Smoking severely depletes vitamin E, a potent antioxidant, and studies have demonstrated that vitamin C works with vitamin E. When smokers are given vitamin C supplementation, their antioxidant levels of E become close to that of a non-smoker. Smoking dramatically depletes folate and other b-vitamins, and smokers with plenty of b-vitamins in the blood cut their risk of lung cancer in half. B-vitamins will calm your nerves, reduce cravings and lower inflammation. Cordyceps have traditionally been used to strengthen the kidneys and the lungs, has anti-cancer compounds against lung and skin cancers, helps reduce inflammation in the airways, reduce phlegm, while also restoring their function. It may increase the production of adrenal cortex hormones and help expand bronchial smooth muscles, increasing oxygen in the body. Calcium and magnesium play many important roles in the body. Magnesium in particular is a vasodilator, one of the most important nutrients for the heart and blood sugar, is calming and already deficient in up to 80% of the population due to depleted soils and other practices.